Hello Kitty Momento, By Nippon Paint! 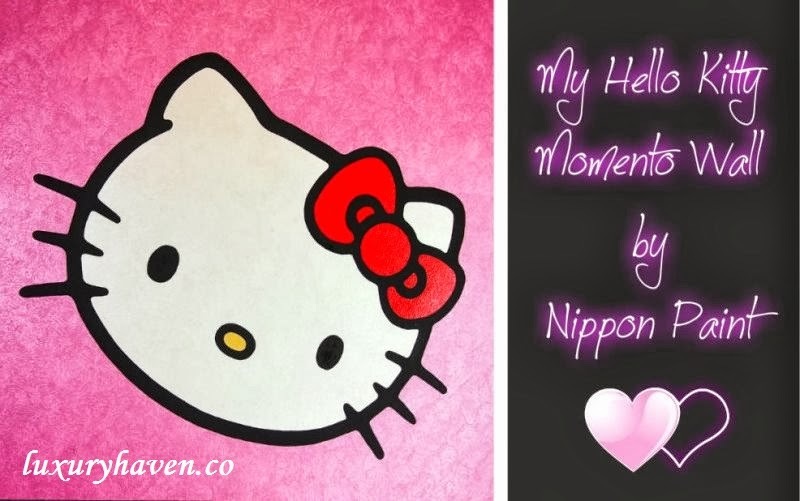 You are here:Home » Product Reviews » Hello Kitty Momento, By Nippon Paint! Be enchanted by the fairytale world of a Hello Kitty room! Thanks to Nippon Paint, it’s a dream come true for me; my Guest/Study Room has gotta be the show-stopper in this entire home make-over! This is where I sit every day, writing & sharing my blog posts with you. It’s hard to make a study room enticing, but there’re certainly ways to improve its aesthetic & make me wanna come in here as often. 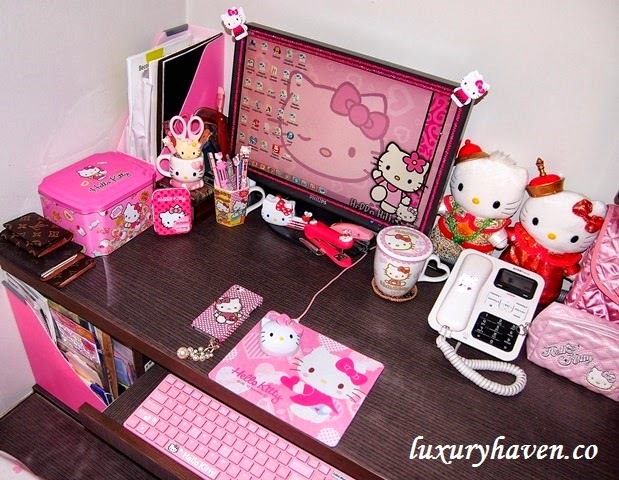 I enjoy accessorizing my workspace with things that I love, & we’re talking about #HelloKitty. Some of the gifts were from thoughtful friends, ex-colleagues, & my students. These decorative items make the work area more personalized & relaxed, & less like a barren desk that screams work, work, work. After all, I’ve already quit my full-time job as an Office Manager for good. Although pink is a darling choice for a gal’s room, it can still inject sophistication for grown-ups with just a touch of shimmer with metallic hues using #NipponPaintMomento Sparkle Silver series. I’ve to admit the pretty colour does bring out the child in me. When Nippon Paint asked me if I wanted something special for this room, I smiled & knew instantly what I wanted. Everyone soon got real excited & went along with my crazy idea! Not surprising, I wasn't the only Hello Kitty fan around; there were another 3 others from the Nippon Paint team! After much discussion on the possibilities, the efficient team finally managed to work it out & got our first artwork! 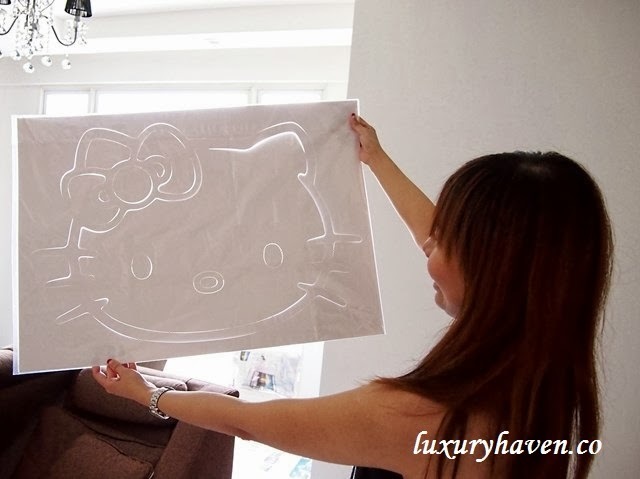 But I wanted something bigger, a huge Hello Kitty on my wall - triple the size perhaps! Check out the pretty Shelly from Nippon Paint who's also a Hello Kitty fan, holding the enormous artwork! Let's check out the Momento™ Specialist working on my #HelloKittyFeatureWall, using the Delicate Flower Effect with Momento’s Hopeful Dawn (MS 118) for the wall, & Radiance (MS 153) for the Hello Kitty character. Tada, here’s my Hello Kitty feature wall for my Guest/Study room! Come, meet my #NipponMomento Specialist, Ah Liang! Hello Kitty fans out there, don’t you envy me? But seriously, someone else would also like to dominate this room! Pls say “Hello!” to Candy! The #HelloKittyRoom will now be a playground for me to take refuge whenever my mood is down. So what do you think of my whimsical notion of having a Hello Kitty feature wall in my Guest/Study Room? 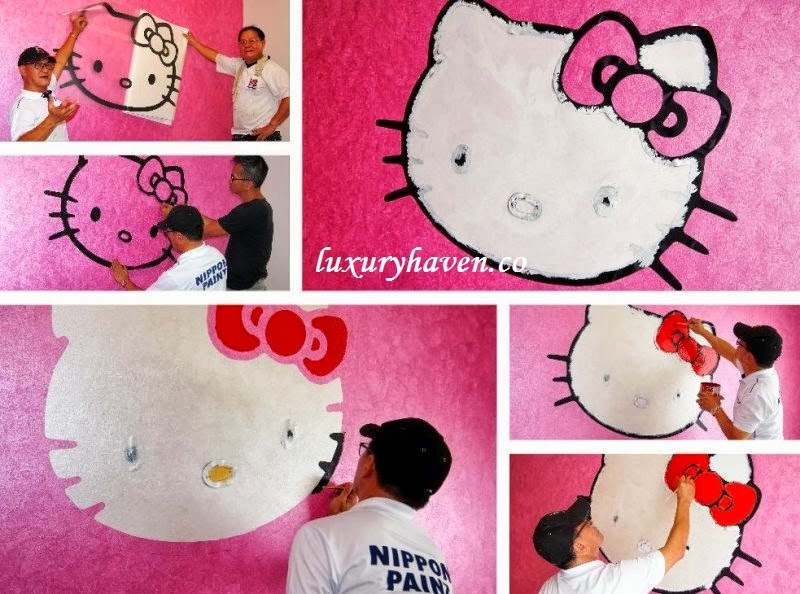 Hello Kitty Room for rent ………. anyone? 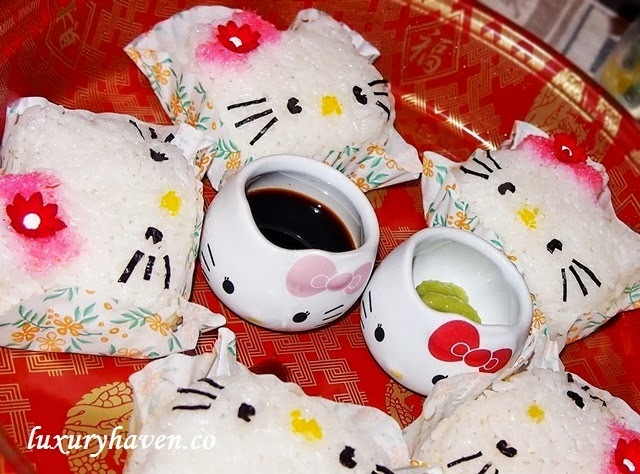 This is definitely worth a celebration complete with Hello Kitty Onigiri, isn't it? Thank you so much Nippon Paint, for my home make-over with a Hello Kitty dream room! Uru, welcome to my Hello Kitty World! *Speechless* Too overwhelmed for words! LOL... I think the bookings for this room will be as long as Orchard Road, Shirley!! Reana, hahaha! Gotta start preparing a booking list! Nava, thks so much for your lovely comments! Kathy, looks like I've to add u to the waiting list! Hahaha! DD, I've yet to visit Hello Kitty in JB too because of security reasons :< Sure! Make sure you bring lots of Hello Kitty goodies to fill up the room & make your mark here! Hahaha! Pepper, finally! My dream room. I'm such a big kid! Lol! YL, so many Hello Kitty fans huh?? Thks, sweetie! such a huge hello kitty! most of the girls will want it tooo! OMG! My wife would go crazy if she sees your HelloKitty room! She has been thinking of even spraying her car white with HelloKitty stickers on it. She has so many items like you and went nuts in Japan looking at the Kitty shops. The wall picture of the cat is very beautiful and striking. Everybody will want to sleep in your guest room now. TM, wish I have a Hello Kitty car too!! I want, I want!! Hahaha! Michelle, good to hear from you! Kylie, so many room reservations already! Hahaha! Kids always love to be in the fantasy of cartoons and one cartoon that stays hot favorite of kids is none other than Hello Kitty. Please invite me. cquek, well said! Hello Kitty has not only entered the hearts of kids, but adults too! Charmaine, must start collecting entrance tickets! Lol! EH, I love the shimmering pink too! Wow! That's cute. I am planning to buy house end of next year, still thinking of how I want my house to looks like. And I plan to DIY myself. *Jaw Dropped* Its a guest room right? I am coming over now to stay in it! haha. I think your property value just soared up! Very nice metallic pink with a real huge hello kitty! Love it! And love all the nice hello kitty accessories too. DS, looks like we've got another Hello Kitty fan! Hahaha! What fun!!! How wonderful you were able to transform a room into the perfect refuge...just for you!!! Liz, sorry for my hubby & son! Lol! Wow, Hello Kitty inspired room...so cute Shirley. You are a real hello Kitty fan. Bal, indeed I am! From Minnie Mouse, to Tweety Bird, & now Hello Kitty! Louise, I'm now enjoy my Hello Kitty space while writing & replying all your lovely notes. Thanks, dear! Have a good weekend! Hong, I love Pink & I adore Hello Kitty! Hahaha! actually me too..hahaha..but scared many will laugh at me..
Hi Shirley, wow... you sure is a huge fan of hello kitty. Lovely room, look so cute! Amelia, indeed I am! Hahaha! SA, hahaha! You're so cute! Thanks for coming by & it's great having you here! Hi, please drop us your contact number at paintingservice@nipponpaint.com.sg so we can arrange for a free wall inspection before giving you a cost estimate. You can definitely specify Ah Liang for the job. :) - Shelly, Nippon Paint.